Estee Lauder White Linen is a perfume that fills you with power. 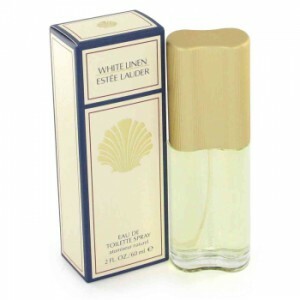 Estee Lauder White Linen For Women 60ml. Eau De Parfum is a perfume for women, floral, delicate and fresh. Beginning of fragrance notes were made of lemon and peach notes that turn into heart perfume scents of roses, jasmine and lilac. Sensuality fragrance is created by blending notes of sandalwood and cedar with sweet essences of honey. Estee Lauder White Linen is a perfume that fills you with power, perfect for hot summer days. Relax and enjoy a really special perfume! White Linen is a fragrance full of femininity and elegance that surrounds you with an aura charming, soft and pure. White Linen perfume by Estee Lauder is based on the original 1978 release of the spirits. According to its lineup, which includes such shades as aldehyde, rose, green notes, White Linen has a clear resemblance to him, though a lot of differences and, in particular, is the presence in White Linen fragrance clearly pronounced fruity notes. Bright White Linen summer scent opens boldly fresh citrus notes, among them prominent theme of red grapefruit and Italian mandarin, pink diluted ice tea and fruit-berry cocktail consisting of raspberry, pear and apple. Heart notes of White Linen perfume is insane beauty matched flavors floral bouquet consisting of smell wild honeysuckle scent with notes of rose and red tulips, delicate petals of gardenia, tuberose, and, of course, the finest jasmine and wondrous. At the end of rich flavor White Linen long final note tart white cedar wood, patchouli and white heliotrope. White Linen - a fragrance for the entire year, including the fascinating energy summer with a refreshing green bouquet.